Temporal contrast sensitivity provides a useful measure of human visual function. In this study we use psychophysical techniques to non-invasively “dissect” (separately measure) the temporal characteristics of the early and late stages of the human visual pathway(s). Monochromatic lights appear to change in colour and/or brightness when flickered. For instance, flickering lights near 560 nm appear brighter whereas lights near 650 nm appear yellower than a steady light of the same mean luminance and chromaticity. As the modulation of the light increases, the change in appearance also increases. For amplitude-modulated flickering lights (with carrier frequency, fc, and amplitude-modulation frequency, fam, such that the frequency components of the waveform are: fc- fam, fc and fc+ fam) the change in appearance is seen as a new frequency component at fam (Fig. 1). This new frequency component is produced by distortion at a nonlinear stage within the human visual system. Fig. 1. Approximate brightness (higher discs) or colour changes (lower discs) produced by amplitude-modulated flickering lights. Fig. 2. An example of the Sandwich model (i.e. linear-nonlinear-linear consecutive stages). We make use of this visual phenomenon and the underlying visual nonlinearity by applying the sandwich model (Spekreijse and Reits, 1982; Stockman and Plummer, 1998) to dissect the temporal characteristics of the brightness (Petrova, 2010; Petrova et al., 2010) and colour (Petrova et al., 2010) pathways into early (pre-nonlinearity) and late (post-nonlinearity) stages (Fig. 2). We used a Maxwellian-view system with a 4º diameter circular target that was amplitude-modulated (Fig. 1) with a high carrier frequency (fc=5–60 Hz) and a low amplitude-modulation frequency (fam=0.5–5 Hz). In addition to setting modulation thresholds for detecting sinusoidal flicker (fc=0.5-60 Hz), observers set the thresholds for detecting the colour or brightness change at fam either as a function of fc (to determine the early temporal characteristics before the nonlinearity) or as a function of fam (to determine the late characteristics). 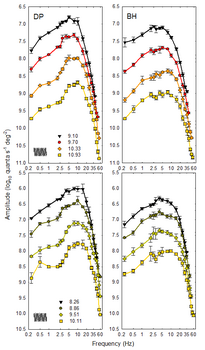 Four radiance levels were used (time-average calibrations in log10 quanta s-1 degree-2 are shown in the legends). First, the temporal contrast sensitivity function (TCSF) was measured using sinusoidally-flickering stimuli. This provided a measure of the temporal sensitivity of the overall visual pathway including all three stages (early linear stage, nonlinearity and late linear stage). The flicker sensitivity was measured for both subjects using a 650 nm target (top row, Fig. 3) and a 560 nm target (bottom row, Fig. 3). Fig. 3. Mean ±1 SE amplitude required to detect flicker for a 650-nm target (top row) or a 560-nm target (bottom row) as a function of flicker frequency. Fig. 4. 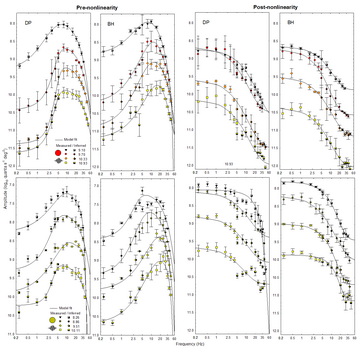 Mean ±1 SE amplitude required to detect colour change (top row) and brightness change (bottom row), of amplitude-modulated lickering stimuli as a function of fc (first two columns) and fam (last two columns). Half-filled symbols show inferred estimates and fully-filled symbols show measurements. The solid lines show the model fits using arbitrary smooth functions to align the low- and high-frequency data. Fig. 6. The describing function of the nonlinearity producing colour change (top row) and brightness change (bottom row). The colour change or brightness change sensitivity measurements as a function of fam allowed the output of the early filter to be measured relative to the output of the late filter. 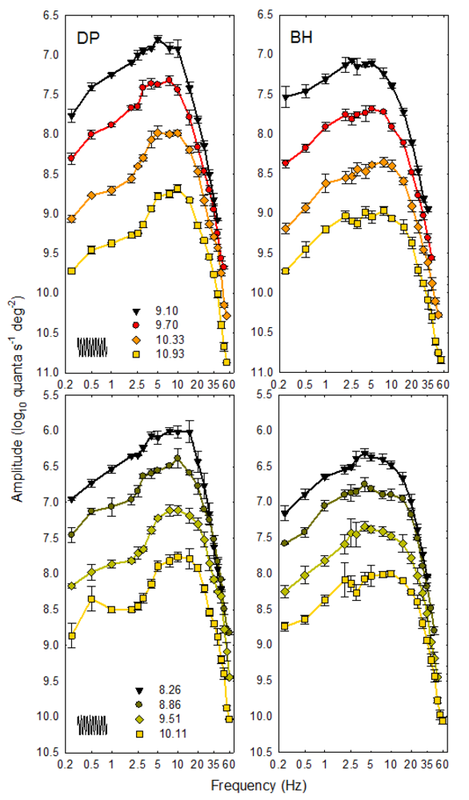 The late filter’s attenuation characteristics relative to the input to the visual system were estimated by scaling the measurements according to the describing function of the nonlinearity (Fig. 6). To estimate the describing function of the nonlinearity, subjects matched the colour or brightness change by adjusting the radiance of a 560-nm sinusoid superimposed on a pedestal of equal wavelength and intensity to the target as a function of input modulation. This gave a measure of the colour or brightness change introduced by the nonlinearity relative to the input modulation (Fig. 6). The early temporal filter seems to be band-pass peaking between 10 and 15 Hz, and falling-off steeply at both lower and higher frequencies. The input-output function of the nonlinearity that produces the brightness and colour changes can be described by an expansive nonlinearity that is clipped at high modulations and intensities. The late temporal filter is low-pass, falling-off in sensitivity at higher frequencies with a slope roughly consistent with a one-stage low-pass filter. 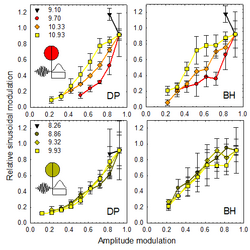 The early high-frequency temporal characteristics, which can be related to photoreceptor responses at higher frequencies, suggest the nonlinearities are relatively early in the visual pathways. Potentially, the analysis used in this study can be used to localize clinical losses in visual function within the retina. This project was sponsored by the Biotechnology and Biological Sciences Research Council UK (BBSRC). Spekreijse H, & Reits D, 1982, “Sequential analysis of the visual evoked potential system in man; nonlinear analysis of a sandwich system” Annals New York Academy of Sciences 388, 72-97. Stockman A, & Plummer DJ, 1998, “Color from invisible flicker: a failure of the Talbot-Plateau law caused by an early "hard" saturating nonlinearity used to partition the human short-wave cone pathway” Vision Research 38 3703-3728. 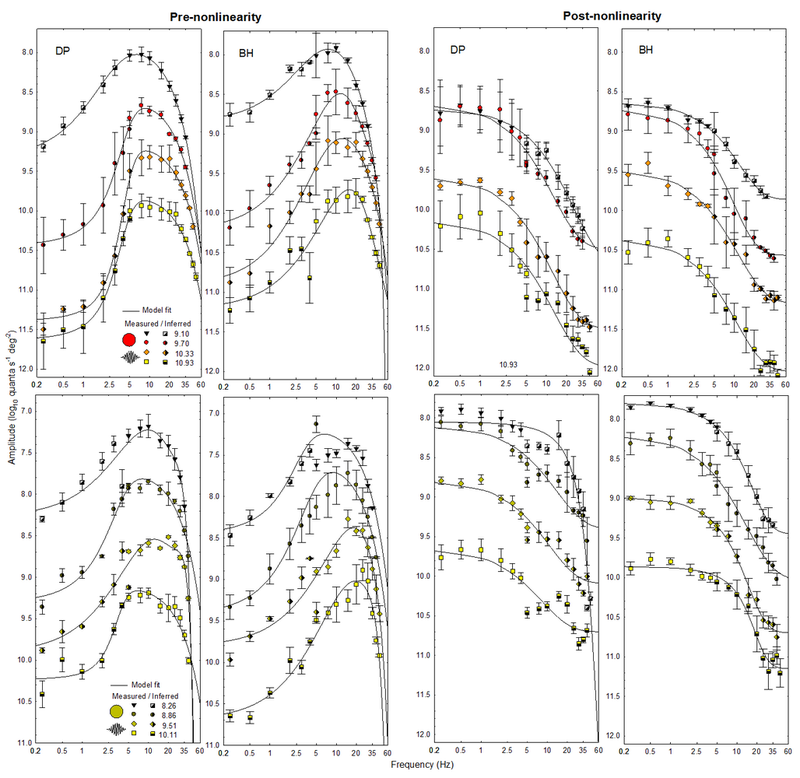 Petrova D, 2010, “Experimental study of the pre-nonlinearity, nonlinearity and post-nonlinearity stages at medium wavelengths” Journal of Vision 10(7) 442. 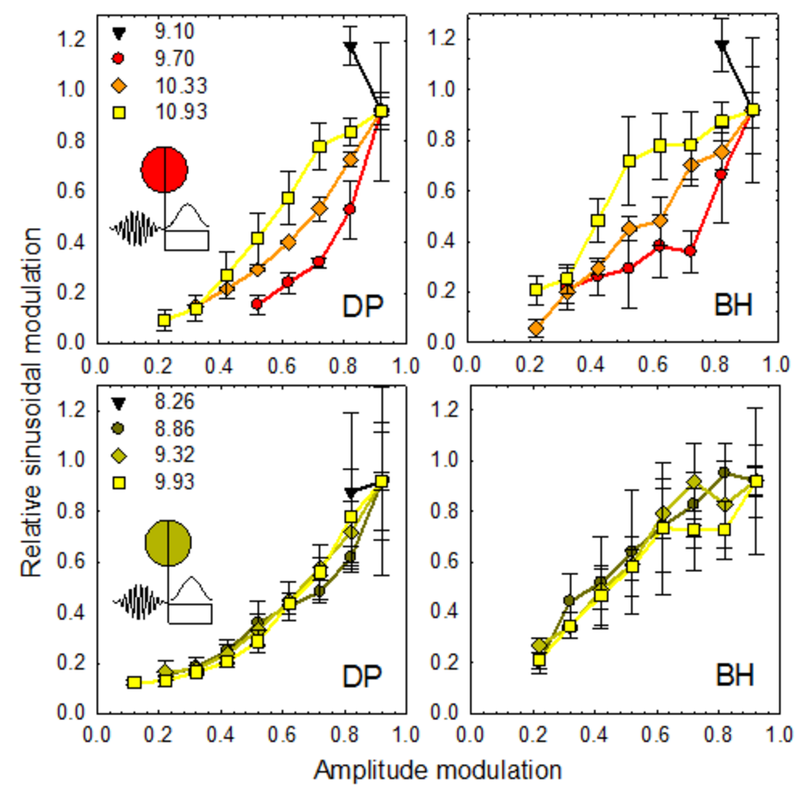 Petrova D, Henning G B, Stockman A, 2010, "Brightness and colour changes of amplitude-modulated flicker used to dissect visual pathways into early and late stages" Perception 39 189.